Shelbi earned her Master of Science in nursing from the University of Central Arkansas in Conway Arkansas and her Bachelor of Science in nursing from Henderson State University in Arkadelphia, Arkansas. Prior to joining our team, she helped open South Point Dermatology in rural Arkansas, where she diagnosed and treated numerous dermatological conditions of the hair, skin and nails. She also successfully performed biopsies and cryotherapy procedures. Shelbi’s personal connection with skin cancer (father diagnosed with melanoma) inspired her commitment to educating the community on the importance of overall skin health and the early detection and prevention of skin cancer. 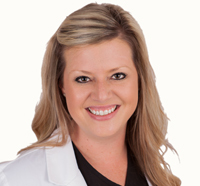 Shelbi is happy to provide comprehensive dermatology care for our patients in Huntsville.